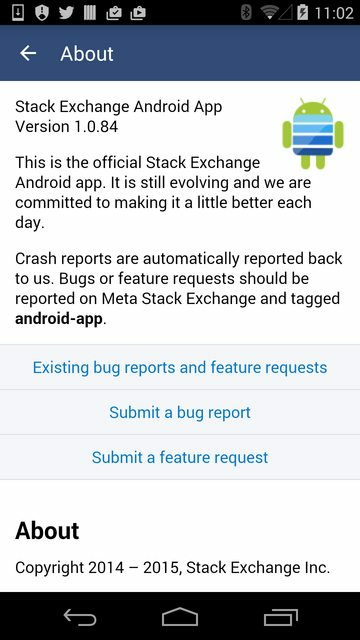 It says "Bugs or feature requests should be reported on Meta Stack Exchange and tagged android-app." Type in a bug description. It asked which site to ask on. At this point I did not realize there was a distinction between "Meta Stack Exchange" and "Meta Stack Overflow". I was not signed up for either of them. I just wanted to report an annoying bug. Note: Those site titles get "..." elided at the top of the Android app so you can't see their full names. That doesn't help reveal the distinction. I think only one of those sites was in the list of sites, but I could be wrong about that. It briefly displayed an error message saying that questions must have the tag [android-app] and the tag [feature-request] or [bug]. I wasn't expecting an error message and it disappeared before I finished reading it. A proper bug report form would have required fields with visible choices. Type "bug" to look up the tag to add. It offers tags [bug] and [bug-report]. Which one do I need? I didn't get to read the full error message. I guessed [bug-report] since it is a bug report. Another error pops up indicating there's a @$%# time penalty delay before I can resubmit. How hard do you want to make this??? Why isn't there a proper bug report form? Why penalize the user for a bad UI? Wait a while then "Submit". If you're lucky, it won't ask again what site to ask on. I don't think I was lucky but I've forgotten. It comes back with the error about needed tags. Now I have time to read it and discover the requirement to add the tag [bug]. Add the tag [bug]. Tap "Submit". There's that time penalty again. Why are you penalizing me for trying to report a bug? Wait a while then "Submit". It churns a while then displays an error that it can't display the question. Did it get posted or not? What went wrong? List recent questions to see if it got posted. Wait a couple minutes. List recent questions again. The question did not show up, but I now suspect that was because I submitted to Meta Stack Exchange while the app was still viewing Meta Stack Overflow. The app should be displaying the site it just posted to [better yet, post to the site it was displaying; don't ask which site to post to], and I was also confused about the two similar site names. Start over asking a question. The app recalls the question from the edit buffer. That seems to confirm that the question didn't get posted, because the app should certainly clear out the question buffer on successful submission. Otherwise it's at risk of posting duplicate questions. The recalled question text was several edits behind the submitted text. That's annoying and may lead to poorly worded retries. Repeat the last few edits, then submit. Another error message about not being able to view the question. Wait a few minutes. View again. I spent an hour and AFAICT did not succeed in reporting a bug. A few minutes later, someone added a comment asking why I asked the question twice. This notification now provided a link so I could finally view and confirm that the question got posted. I still can't find the question in the list of questions. ... Eventually by poking around on the web site I figured out that there's both a "Meta Stack Exchange" and a "Meta Stack Overflow". There's nothing in the Android app to explain this subtlety. Not a good UI. Again, I'm just trying to report a bug, not engage in meta-Q&A. I'm not really interested in the distinction between these two meta forums. "Meta Stack Exchange" is not in the app's list of SE sites. I eventually got that question posted but forgot to include the app version number, OS version number, and device model. Even with long s/w industry experience we need prompting for that. This is another UI part missing for a M-SE post to function as a bug report form. See also Can't report a bug in the Android app from the Android app itself where the asker tripped over some of these problems and didn't figure out the Meta SO/SE subtleties. While this question overlaps that question, please keep in mind that I'm trying to report bugs and usability bugs here, and I still don't know why the posted questions weren't viewable. See also https://meta.stackoverflow.com/questions/285958/horizontal-scrolling-broken-by-vertical-motion which is the bug report I managed to submit. It probably belongs on Meta Stack Exchange instead of Meta Stack Overflow but I don't know how to move it and I've spent too many hours reporting a bug. This will be fixed in 1.0.85. Whew, this bug report was beautiful. There were so many bugs to fix in here. Let's start from the top. 1-4: This is all pretty standard. I'll be making this more direct as I'll discuss below. 5: There was some really old code, probably form before we supported joining a site in the app, was ignoring the site provided to the editor if you were not a member of the site. I just completely ripped that out since you can now join any site by asking a question. 6-7: The tag picker will now show the required tags for a site above the search results. 8: We will now do client side validation of the required tags, so if you were missing one it will be caught before the time penalty logic. Still, we should do something about penalties on failed submissions. 9-10: These shouldn't be an issue with the other fixes. 11: This bug will be fixed as described here: "This question is not available, it may have been deleted" when submitting a question on the Android app after losing internet connection. 12-13: This is part of the same caching issue as described in the linked post in 11. I probably will add some cache breaking there but by getting you to the right question in the first place, it should significantly relieve that problem. 14-19: These shouldn't be an issue with the other fixes. When you go to the About screen, there will now be three big actions available: View existing bug reports, submit a bug, submit a feature. 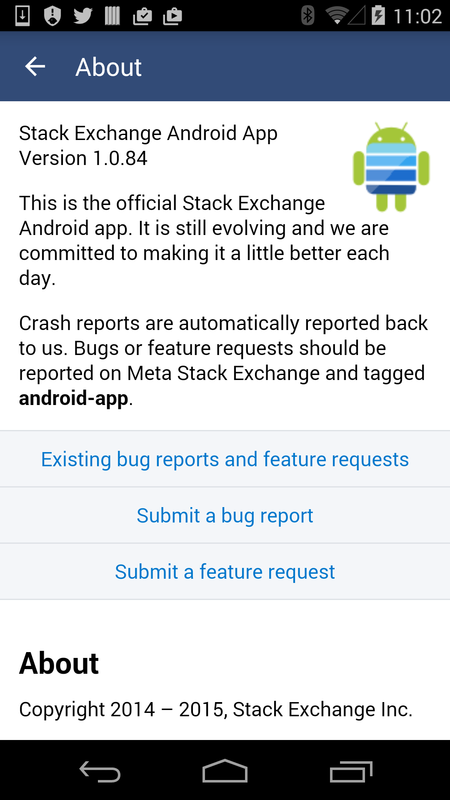 Tapping "existing" will take you to Meta Stack Exchange like before but will filter it to android-app questions. 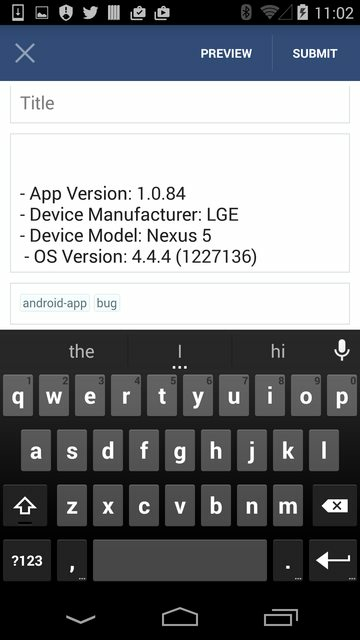 Tapping "feature" will start a new meta post with the tags android-app feature-request. Tapping "bug" will start a new meta post with the tags android-app bug and the app version, Android version, device manufacturer, and device model pre-populated. Not the answer you're looking for? Browse other questions tagged bug status-completed android-app .